The Bangladesh Navy originally under Bangladesh Forces was created during the Bangladesh War of Independence in 1971 against Pakistan. Its official creation was established in July 1971 during the historic Bangladesh Sector Commanders Conference 1971. 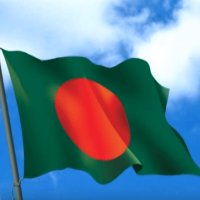 In 1971, with West Pakistan imposing a military rule in East Pakistan, the Bangladesh War of Independence also known as Bangladesh Liberation War was truly underway. Many Bengali sailors and officers in the Pakistan Navy defected to form the Bangladesh Navy. On 9 November 1971, the first naval fleet consisting of six small ships was inaugurated. Initially, there were two ships and 45 navy personnel. These ships tried to carry out raids on the Pakistani fleet and later were mistakenly hit and sunk by Indian fighter planes on December 10, 1971. A major attack was launched on Mongla seaport. The Bangladesh Navy has a strength of 28,000 personnel including about 5,000 officers(estimate). It is mostly limited to coastal patrolling, but it has a modern Ulsan class frigate built in South Korea along with another Guided Missile Frigate equipped with C802 anti-ship missiles. It also has different type of ships including patrol frigates and other ships. The navy has an ambitious procurement plan to ensure security of its maritime boundary.